Are you visiting Seattle soon? Do yourself a favor and spend a day on the stunningly beautiful Olympic Peninsula, a scenic ferry ride and one hour drive from downtown Seattle. A great way to see the peninsula and view the scenery is by taking a wine tour. We have eight member wineries on the peninsula. You can see them all during one full day of touring the Peninsula! Note: Make sure to check winery listings for when you can stop by or make an appointment for a tasting! Once you’ve crossed the Hood Canal Bridge, head about 10 miles further until you see Center-Sr 104 loop and take a right. Take an immediate right into Center Rd. Four miles later, turn on Country Meadow Rd. About a quarter mile down, take a right on Barn Swallow Rd. This brings you to Finnriver Farm and Cidery, at 62 Barn Swallow Road in Chimacum. This is a fun route through the back roads to the adorable town of Port Townsend. Head south on Barn Swallow Rd., back the way you came in. Take a left on Country Meadow Rd and then take a right to get back on Center Rd. Head about two and a half miles and take a left on Rhody Dr. Three miles later continue onto Airport Cutoff Rd. This will bring you to Rte. 20 E. Drive about two miles down and take a left on S. Jacob Miller Rd. Two more miles and take a right on Hastings Ave West. FairWinds Winery will be on the left, at 1984 Hastings Ave W.
If you leave Seattle around 9 a.m. it will probably be about lunch time when you leave FairWinds. Head into Port Townsend to get a bite before getting back on the road. Get back on Rte. 20 heading West. Six miles down, take a left on Eaglemount Rd. 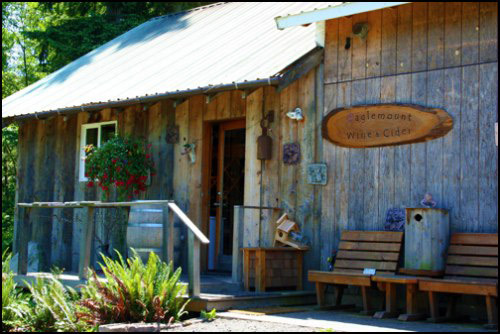 Eaglemount Wine and Cider will be about two miles down, at 2530 Eaglemount Rd. Cider is a nice, light way to start a day of tastings! 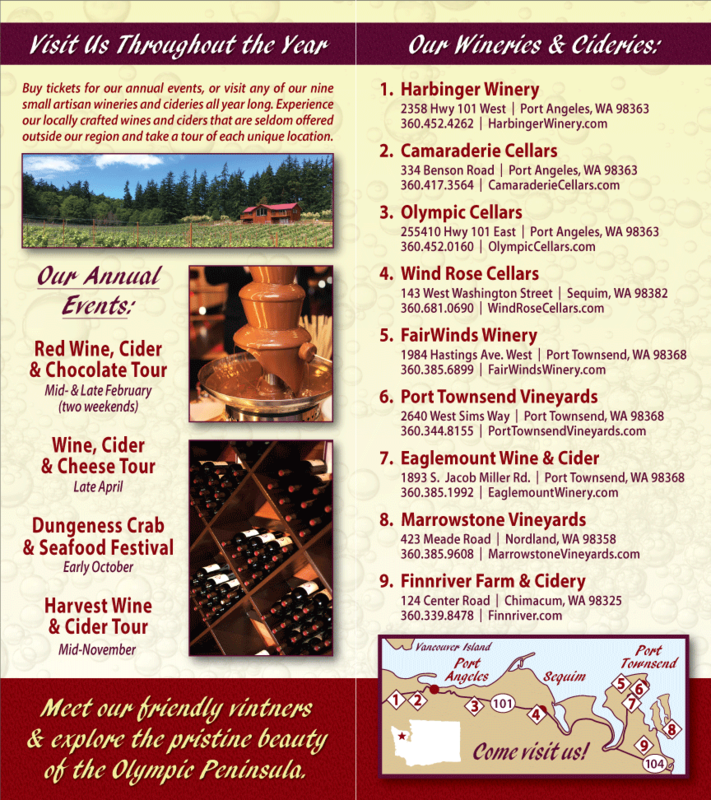 Check back soon to see the rest of our Olympic Peninsula Wine Tour Routes!